Toyota Gazoo Racing’s trio of Fernando Alonso, Kazuki Nakajima and Sebastien Buemi have won the 6 Hours of Spa-Francorchamps, the first round of the 2018-2019 FIA World Endurance Championship super season. It’s the first FIA WEC victory in a career for F1 superstar Alonso who joined Japanese team this year in the #8 Toyota TS050 Hybrid. As expected, Toyota recorded a 1-2 victory in the season-opener at the iconic Belgian circuit. The #8 TS050 Hybrid was in the lead for most of the race. In the end, Alonso crossed the finish line 1.4 seconds ahead of Mike Conway in the #7 car. Conway was sharing a car with Jose Maria Lopez and Kamui Kobayashi. They had to fight their way up from the rear of the field after starting the race from the pitlane one lap behind, as a result of the post-qualifying penalty. Rebellion Racing was the best of the non-hybrid LMP1 teams, provisionally taking P3 and P4 with their R13 cars. 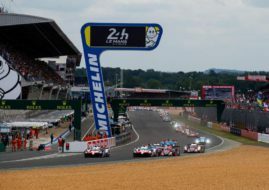 Andre Lotterer, Neel Jani and Bruno Senna finished third in the #1 car, two laps behind the Toyotas and 41 seconds ahead of the #3 car, driven by Thomas Laurent, Mathias Beche and Gustavo Menezes. However, the #1 car was later disqualified after the post-race measurement of the skid block did not comply with the Technical Regulations. That means the #3 crew inherited a podium. In the LMP2 class, G-Drive Racing takes second consecutive class victory at Spa with Jean-Eric Vergne, Andrea Pizzitola and Roman Rusinov in the #26 Oreca. Vergne crossed the finish line 21 seconds ahead of Ho-Pin Tung in the #38 Jackie Chan DC Racing’s Oreca. Tung’s co-drivers were Stephane Richelmi and Gabriel Aubry. Signatech Alpine’s #36 crew completed the LMP2 podium with Andre Negrao, Nicolas Lapierre and Pierre Thiriet as drivers. In GTE Pro class, Ford started from pole position and took the first win of the season. The #67 Ford GT, which started from pole, ended the race in the wall at Raidillon. Harry Tincknell, fortunately, walked away unharmed. The victory goes to the #66 Ford GT, driven by Olivier Pla, Stefan Mucke and Billy Johnson. They defeated the #92 Porsche crew (Michael Christensen, Kevin Estre) and the #71 AF Corse Ferrari crew (Sam Bird, Davide Rigon). The GTE Am class saw the closest finish as Pedro Lamy in #98 Aston Martin Racing Vantage held off Euan Hankey in the #90 TF Sport Aston Martin, crossing the finish line with just 0.221s gap. Lamy was sharing a car with Paul Dalla Lana and Mathias Lauda while Hankey was sharing a car with Charlie Eastwood and Salih Yoluc. The #61 Clearwater Racing Ferrari of Weng Sun Mok, Keita Sawa and Matt Griffin finished in the third place.